COUNTERING SOMALI PIRACY – SUCCESS, FAILURE OR STATUS QUO? On the 5 July 2012, a Reuters news article asserted that the international anti-piracy efforts and more (foreign fishing) boats carrying armed guards have accounted for the improvement in maritime security around the Seychelles. The article mentions how the Seychelles’ economy will improve as a result of these efforts, noting that it is dependent on tuna exports and tourism. Pleasingly, the favourable position in the fight against the Somali pirates around the Seychelles is currently being replicated all over the Somalia Basin, Gulf of Aden and Arabian Sea. However, it is too early to declare victory. 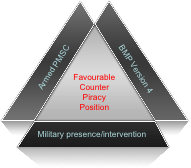 It is possible for much of the recent gains to be quickly reversed should one of the three main pillars countering piracy (Military, PMSC and BMP) be removed. The main activities making a difference in counter-piracy are: the coordinated naval presence; the shipping industry’s Best Management Practice (BMP) doctrine; and Private Maritime Security Companies (PMSC). Each activity is distinctly separate, yet mutually supportive with interlocking measures of effect. Figure 1 shows the three mainstays of reducing the success rate of piratical attacks. It is not meant to imply that an armed PMSC is considered mandatory for each merchant ship (whereas BMP should be! ), however because they are being employed at sea, it would be trite not to acknowledge the difference they are making. Turning to the military effort the “Big Three”, made up by the Combined Maritime Forces (CMF), NATO and European Naval Forces (EUNAVFOR) who, along with independently deployed military forces, have amalgamated their efforts to disrupt and deter piracy in an area covering 2.5 million square miles of the maritime environment. To put that into perspective, this area is almost as large as continental USA, or mainland Australia. The constabulary operations in which the sparse military assets are performing have been quite effective of late, bearing in mind the enormous area they have to patrol. Similar to domestic police on land, navies who patrol these waters rely on a wide range of intelligence led products. Much of this is generated in a cooperative approach between key stakeholders and includes information sharing, coordinated patrols of areas identified as prone to a higher number of attacks, joined up convoy schedules (by those that deploy independently), and physical response to piracy attacks. It’s the latter activity that requires properly implemented BMP and/or a PMSC for a merchant ship to firstly evade capture and then report the incident for the military to disrupt. It is no coincidence the number of disruptions by CMF, NATO and EUNAVFOR of dhows (used as “Mother ships” from which smaller boats are launched to conduct attacks) and independent smaller boats (skiffs and whalers) involved in piracy has increased quite markedly over the past year. Every disruption means there is one less Pirate Action Group (PAG) able to attempt further attacks on those going about their lawful business on the seas. The use of PMSCs is not without concern. Evidence suggests that, to date, no merchant ship has been pirated that had an armed PMSC team aboard, and there can be little doubt that numerous cases exist of ships fending off persistent attacks through the use of an armed security team (civilian or military). The legal regime governing PMSCs, and especially the use of force by embarked security teams (civilian or military), is not comprehensive. In particular, differing national interpretations of the right to use force in self-defence, and differing (or absent) national laws setting out the powers and legal responsibility of these teams in international waters, can mean that PMSCs who use excessive or inappropriate force may not be held responsible for any damage they cause. There is strong evidence that BMP is working. Anything a merchant ship can do to make itself a hardened target adds valuable time for a warship to respond. One concern is the large number of ships that pass through the Gulf of Aden on any given day that do not comply with ALL aspects of BMP. The latest figures provided by the EUNAVFOR led Maritime Security Centre – Horn of Africa (MSCHOA) are that nearly 30% (of 23,000 ships/year) do not report BMP compliance. That’s a staggering number of nearly 7,000 potential targets remaining for pirates to attack in any given year. When considering the scourge of piracy in Somalia, it’s worth considering the practice as a business for those desperate men, turned to crime, who want to make a lot of money. There is a network of financiers, footman who capture ships, those that control the ship once pirated, and those that guard and run ransom negotiations. The significant reduction in success the pirates are currently experiencing has put a squeeze on their business model with many financiers presumably losing money. Nonetheless, the frustrating fact is that it only takes one or two ships to be pirated and the business model is refreshed with the financiers coffers filled again. Whilst the news reports of an improving situation concerning piracy off Somalia are always welcome, it is worth looking at the words of Sir Winston Churchill, which can aptly sum up the current situation – “”Now this is not the end. It is not even the beginning of the end. But it is, perhaps, the end of the beginning.” However, the pirates have proven to be a cunning and ingenious foe in the past and are seldom contained for long. Much like a partially filled balloon will bulge if squeezed with both hands, so too will the pirate’s procedures if squeezed by anti-piracy measures. Furthermore, the opportunistic nature of those desperate men will mean all the measures currently in place will be required for quite some time yet. Indeed, mission completion will ultimately require rule of law ashore in Somalia and that is some way off. Hopefully, those thinking the problem is solved will think twice before removing BMP measures and nations will not stop assigning necessary military assets to this worthy cause. The region’s economic future depends on it. Captain Bruce Legge, CSC, RAN joined the Royal Australian Navy (RAN) in 1986 as a Seaman Officer. He has served in numerous ships throughout his career, the most recent being in Command of the frigate HMAS WARRAMUNGA from July 2009 until December 2010 (for which he received a Conspicuous Service Cross). He joined the Combined Maritime Forces (CMF), Bahrain, in December 2011 where he will serve as the Director Operations for twelve months. Captain Legge has a Master of Arts (Maritime Policy) from the University of Wollongong, and a Master of Arts (Defence Studies) from the Kings College London. He is married and his other interests include Australian Rules Football, Cricket and maintaining fitness through jogging and the occasional game of tennis.